The OneDrive service lets you share files with others. Sharing files and folders online can be easier than sending them as attachments because email apps typically limit how much data you can send at one time. You can share a file or folder that you’ve already stored or created. 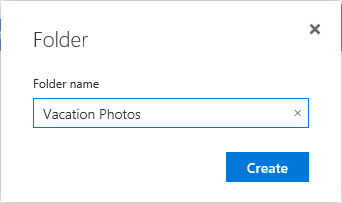 Find the file or folder that you want to share in OneDrive (online). Right-click the file or folder, and then click Share. Or, move the mouse pointer over the file, click the round check button that appears, and click Share in the toolbar. If you need to share multiple files, move your cursor over each one first and click the round check button that appears. Then click the Share button in the toolbar. Click in the box below the To field, and then type a message. If your account is not verified, you might be prompted to complete a security check. Click the Please Complete This Security Check link, type the characters displayed into the text box, click Continue, and then click Close. You then should be back at the Share window, where you can click the Share button. Click the field labelled Recipients Can Only View for more sharing options, such as allowing others to edit the shared file. At the screen that confirms that the file has been shared, click the Close button. The people you shared with receive an email message with a link for viewing the shared file. When you share a word-processing file with another person on OneDrive and grant permission to edit it, she can edit it in Word Online (a cloud version of Microsoft Word) or open the document in Microsoft Word on her computer. This is also the case with Excel and PowerPoint files. You also can share a file or folder directly from the OneDrive folders on your computer. 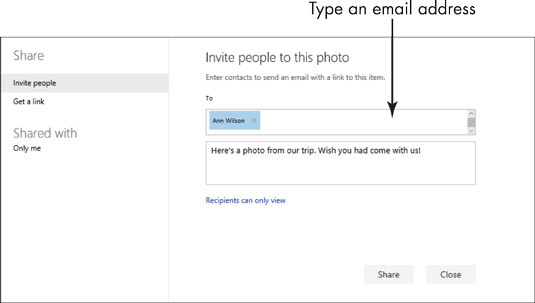 Right-click the item to share, and click Share a OneDrive Link. This automatically copies the link to the Clipboard, and you can use Ctrl+V to paste it into an email message. You can keep your shared files in order by placing them in folders on OneDrive. After you’ve placed content in folders, you can then share those folders with others. This ability to share individual folders gives you a measure of security, as you don’t have to share access to your entire OneDrive content with anybody. Open your browser, go to OneDrive.com, and sign in with your Microsoft account if prompted. If you want the new folder to be created within one of the three default folders, click a folder first. In the menu, click Folder.